» New Website is Now Live! Which Forums Do You Post Most On? 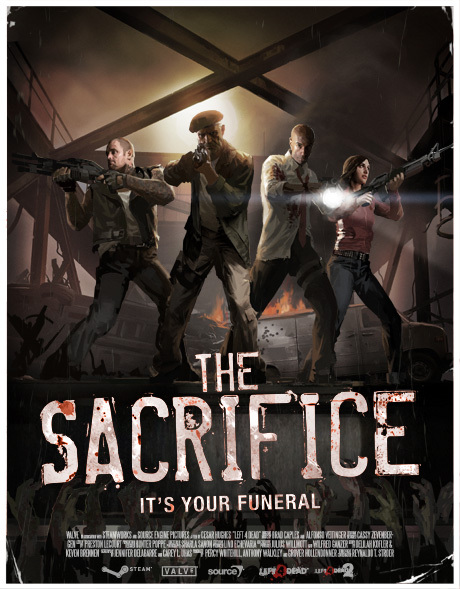 The 2nd of the 'Crossover' DLC's (free for PC ofc) is coming out OCTOBER 5TH and is called "The Sacrifice"
“The Sacrifice” is the prequel to "The Passing," and takes place from the Left 4 Dead Survivors' perspective as they make their way South. You may read the comic to find out the official version of events or this October 5th you may play the game to choose your own ending. In "The Sacrifice" for Left 4 Dead, gamers receive the complete Sacrifice campaign with maps playable in Campaign, Versus, and Survival. There are 5 new achievements, a new style finale and plenty of places for devastating Hunter pounces. For Left 4 Dead 2, gamers receive “The Sacrifice” campaign and L4D1’s “No Mercy” both playable with the L4D1 Survivors. This version also offers 5 new achievements. In the L4D2 version of “The Sacrifice” each campaign is playable in Campaign, Versus, Survival, and Scavenge modes, and both "The Sacrifice" and L4D2 version of No Mercy feature the Left 4 Dead 2 Special Infected, items, and weapons. Yes, Zoey with a chainsaw! Dead Rising 2 is making me chuckle way too much....they allow you to wear ridiculous outfits, then when you get to the cut-scenes..... you're still wearing them! Hehehe I've already got the comic downloded to to .pdf. Pretty awesome but I don't know if I can bear watching Bill getting killed! Agreed. I hear rumours thatthe original L4D owners get to scrap with the special infected's from L4D2 as well. Tando's Cutscene a.k.a "nice hat, dude"
LW's Cutscene - a.k.a "Blanka Lives!" "I Never Draw My Gun, Unless I Intend to Use It"
and speaking of THE PASSING, here is PrioryJK, Tando and myself playing L4D2's DLC - The Passing. Playing (an enjoying quite a lot) Borderlands. Yup yup took it on steam >_< got hard time finding a decent LMG... But the game's really cool both in term of design and gameplay. Subject: Re: What Are You Playing? » How long have you been playing fantage? » Isnt MyBrute (now) Boring ! » Anybody play the facebook game?